Kim Waits is a writer and educator living in the scenic mountains of North Georgia. Waits has over 10 years experience writing, teaching and researching for a variety of mediums, including curriculum writing for grades Pre-K through 5th grade. Waits studied "Strategies for Promoting Language & Early Literacy Development" with Dr. Hanne Gettschalk. She specializes in writing about early childhood education. When your toddler's scalp becomes excessively dry it can cause flaking and itching, making her cranky and uncomfortable. While most cases of dry scalp in toddler's respond well to home care regimens, your child may also be experiencing dry scalp due to a more serious condition such as ringworm, eczema or dermatitis. If this turns out to be the case, prescription treatments may be necessary. The best way to alleviate the symptoms of your toddler's severely dry scalp is to determine the underlying cause and select the proper form of treatment. 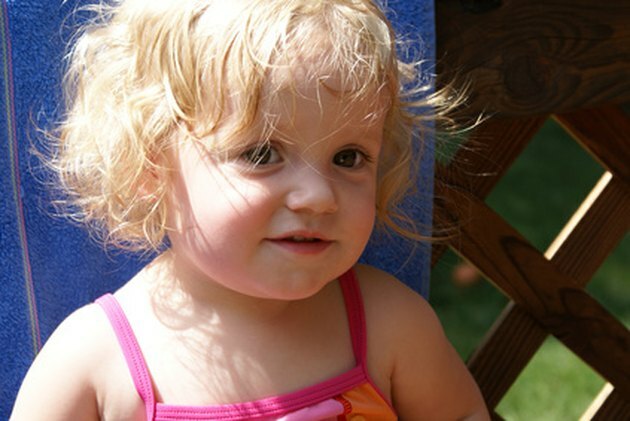 Avoid shampooing your toddler's hair too often. Dr. Jim from Ask Dr. Sears recommends washing your child's hair once a week. Washing the hair daily can rid the hair of its natural moisture and may contribute to your toddler's dry scalp. Brush your toddler's scalp to loosen any dirt or dry flaky skin. Choose a brush designed for toddler. The soft bristles will help protect your child's tender scalp from injury. Brush your toddler's hair when it is wet, using slow gentle strokes to exfoliate the skin. Wash your toddler's scalp and hair with a fragrance-free baby shampoo. Use a soft washcloth designed especially for babies and toddlers to lightly massage the shampoo into the hair and scalp. Thoroughly rinse the hair so that no shampoo residue remains on your child's scalp. Deep condition your toddler's scalp and hair. Apply a quarter-sized dollop of a gentle moisturizing conditioner to your hands and massage it into your toddler's hair and scalp. Allow the conditioner to remain in the hair for at least two minutes, then rinse with clean lukewarm water. Contact you toddler's pediatrician if the condition persists. According to babycenter.com your child's dry scalp may be caused by his environment or he may have a more serious condition such as eczema, which is characterized by thick, dry skin and small red bumps that may ooze and blister. If your toddler is diagnosed with eczema, your pediatrician can prescribe a topical steroid to treat the condition. Use lukewarm water to wash your toddler's hair and scalp. Water that is too hot can actually contribute to your child's dry scalp. Avoid excess heat such as blow dryers as this can irritate your toddler's dry scalp. What Causes a Toddler's Hair Not to Grow?